In a mixing bowl, combine almond flour, arrowroot starch, cassava flour, baking powder and salt. Cut in shortening until you get coarse crumbles. Slowly add in milk until dough forms. Form into about 8 biscuits. Bake at 375° F for about 15-20 minutes or until cooked through. Meanwhile, heat oil in large skillet. Add in sausage, crumble and brown for about 10 minutes or until completely cooked through. Sprinkle on arrowroot starch and stir until mixture is like a thick paste. Sprinkle on salt, pepper and sage. Slowly pour in milk and bring to a simmer over low heat, stirring constantly. Once mixture thickens turn off heat and let rest. Pour warm gravy over hot biscuits and serve. 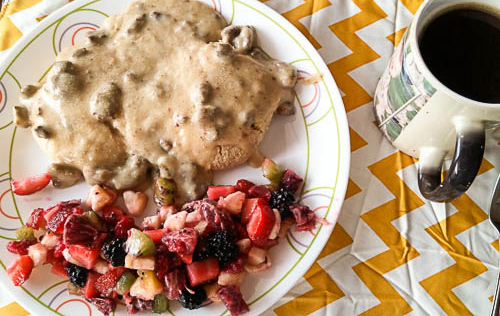 Courtney from Weir, KS won $50 for this recipe and photo! Submit your coconut recipes and photos here!